One important point to remember about iBGP relationships is that iBGP assumes that all of the routers within a single AS are fully meshed. That is, each router is peered to every other router within the same AS. The purpose of this is namely to fix any issues around loop prevention. You’ll recall the BGP uses the AS-Path attribute to prevent against loops. A BGP speaker will drop any update it receives that has its own AS listed in the AS-Path attribute. Since iBGP updates are sent within a single AS, the AS-path attribute isn’t updated and if iBGP speakers continued to forward updates, we would have routing loops. Bottom line is that iBGP speakers will not forward iBGP learned routes to other iBGP peers. As you might imagine, in some network designs, peering each router to every other router in the same AS could be quite complicated and costly. One of the ways to get around this restriction is to use route reflectors. eBGP routes learned by route-reflector servers are advertised to other eBGP neighbors, route-reflector clients and non-clients. iBGP routes learned from route-reflector clients are advertised to other clients, non-clients and eBGP neighbors. 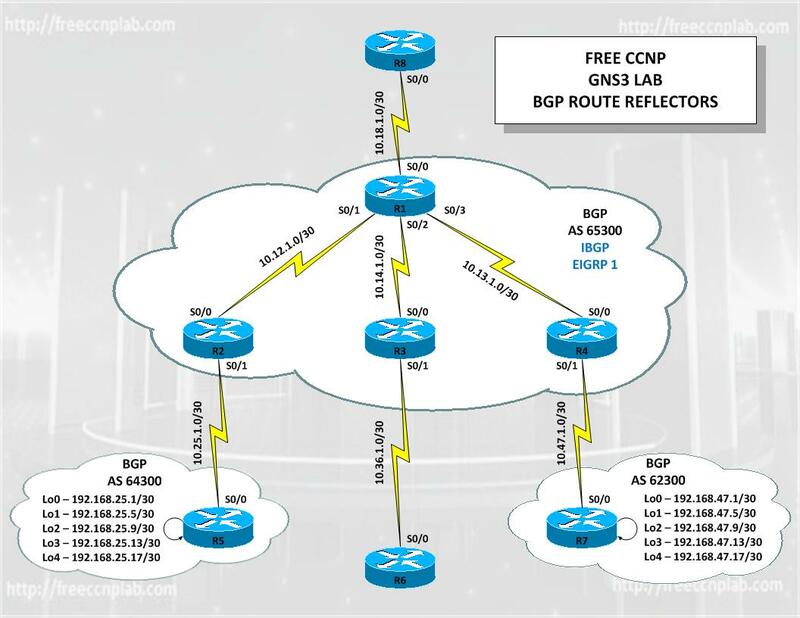 In this free CCNP GNS3 lab we will use GNS3 to model a small network consisting of eight Cisco 3725 routers to understand how BGP Route Reflectors work and to demonstrate how to configure them on Cisco IOS routers. Review configuring IP address and subnet. Learn to configure route reflectors.